The OCPL Archives is pleased to announce that the Eddie Martin and William O’Leary Photograph Collection is fully processed, cataloged and available to the public for research purposes. This visually stunning collection offers a glimpse into Wheeling’s history throughout the 19th and 20th centuries. Eddie Martin, a North Wheeling native born in 1922, expressed an early affinity for photography and, in 1944, began an apprenticeship under the famous Wheeling photographer George Kossuth. Eddie was born with a physical disability – a spinal disfigurement that caused a hunched back and shortened stature – but he never let his physical limitations keep him from his passion for photography. Upon the death of his mentor, Martin went on to work with another noted Wheeling photographer, Charles F. Gruber. While working with Gruber and then later under his own imprint, Martin began to collaborate with the Diocese of Wheeling-Charleston and often served as the official photographer at many of the parish schools and their related functions. 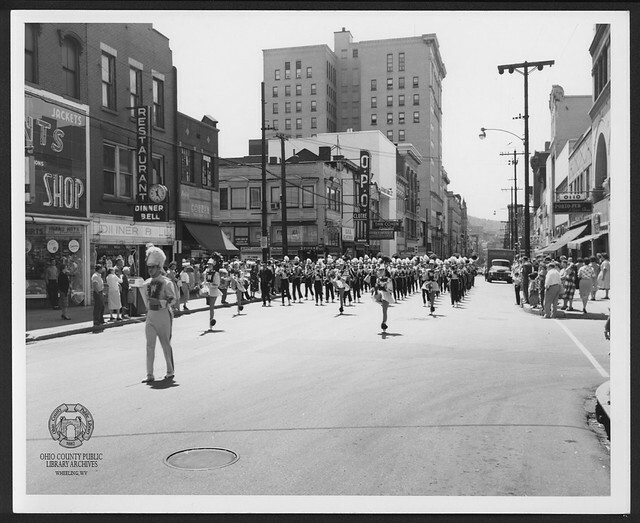 Martin’s photographs document much of Wheeling, West Virginia during the 20th century. Noteworthy examples include John F. Kennedy's visit in 1960 and numerous parades and celebrations held by the city on behalf of the men and women serving overseas in World War II. Also of note are aerial shots of downtown Wheeling which show the growth of a city in the 1940s and 1950s as well as the later repercussions of urban renewal and the economic downturn. Martin also had a propensity to document disasters, and there are many photographs of neighborhood fires, automobile crashes and, of course, the various floods he witnessed in his lifetime. He was also a collector of historic Wheeling photographs, and these images provide an unprecedented look at Wheeling’s late 19th and early 20th growth. William “Bill” O’Leary, a close family friend, received the majority of Martin’s photographs and other papers through his sister’s estate after her death. Bill O’Leary was an amateur photographer and Wheeling history enthusiast, and the collection includes many of his own photographs, as well as historical Wheeling postcards and memorabilia. Many of the photographs have been digitized and are available here. For more information and a detailed description of the collections’ contents, visit this page.